When I was young I would visit my ancestral village during vacations. The biggest attraction during those trips was a hunting excursion.Around fifty men would surround the base of a mountain and beat drums and create a shrill sound. Scared by loud noise and cornered by the large crowd, various animals would scuttle atop, only to run into men armed with guns, and meet their death. During one such occasion an antelope with big horns darted from the bushes, but was felled by a volley of bullets. The villagers ran to him and tied him with ropes. I came nearer. There were big holes in his beautiful body; he was gasping and bleeding from his mouth and wounds. The men began cutting him up. “Why have you done this?” I asked. “He was so beautiful!” No one answered me. In a short while, his body was cut into lumps of flesh and distributed. “I will never eat meat again,” I told my relatives when I returned. After one month I met a friend who had been indulging in various bad habits. But now he was completely changed. He was wearing tilaka and tulasi beads around his neck. He wanted to take me to an ISKCON program in Kolhapur. I refused two or three times. The fourth time, simply to please him, I agreed to visit. I liked the question and answer session in the program. Then the devotees showed a special video on Srila Prabhupada. I saw foreigners dancing in kirtana. “Oh! White men and women! How are they singing Hare Krishna with an old Indian gentleman?” I wondered. One Friday, Akrura Dasa spoke about Lord Caitanya how the Lord has so many fruits that He cannot distribute alone. “I need volunteers to distribute this fruit of love of God,” the Lord proclaimed. 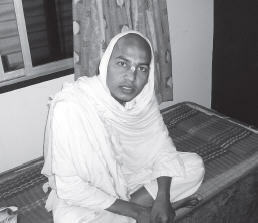 I thought, Why don’t I join Lord Caitanya and help in the preaching mission? The next day it was announced that Padayatra India was in the town for three days. On the last day I decided to join them. My family members came to meet me after some time. I politely, but firmly expressed my decision to them. Some time later they began to chant. Now most of them are chanting 16 rounds. It is my ninth year in padayatra, and I am completely blissful. 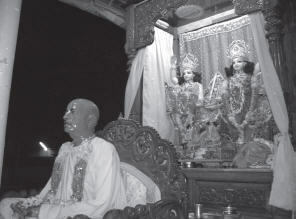 Mohana Rupa Dasa is a disciple of His Holiness Lokanatha Swami Maharaja and a member of Padayatra India.